Eco-Justice Notes - 4/5/19 - How Much is Enough? That's a question that lurked behind the scenes of last week's Notes, but it wasn't directly addressed. I did get comments back from two readers, though, who pointed out that my reflections on "an attitude of gratitude" didn't take adequate account of the global poor. One of them wrote, "for about 1/3 of the people on the planet, desiring less is not very meaningful as often what they desire is enough to survive." "Enough" does have very different meanings for the rich and the poor. The spiritual and environmental dangers of consumerism are not front-line concerns of those who have nothing. But the overblown desires of the world's rich also shape the expectations of the global middle, and those who are rising out of poverty. That's an ongoing problem. Let's start by considering the poor. For them, enough is about survival. "Enough" is a very different consideration for those of us who are among the world's affluent. We most often encounter "enough" in terms of our wants, instead of our needs. It has to do with satiation, not survival. How much is enough? Enough is a baseline of survival for the billion people who don't have enough of anything, and for the species that are being crowded out of existence. And enough is an upper boundary on the wants of the affluent, to ensure that there are sustainable resources to meet the needs of all. The ethical norm of sufficiency defines a floor, below which we can't consider poverty and deprivation acceptable, and a ceiling, above which wealth and consumption can't be considered appropriate. The space between the floor and ceiling is the broad area where we can look for a reasonable expression of enough. The trauma of extreme poverty was a central concern of the UN's Millennium Development Goals, which had a target of cutting the 1990 poverty rate in half by 2015. That goal was achieved in 2010, five years ahead of schedule. According to recent estimates, in 2015, 10 percent of the world's population lived on less than US$1.90 a day. That's down from nearly 36 percent in 1990. $2 a day is way below the floor. And those levels of poverty aren't just an catastrophe for individuals. The UN notes that, "Most people living below the poverty line belong to two regions: Southern Asia and sub-Saharan Africa" and "High poverty rates are often found in small, fragile and conflict-affected countries." Much more needs to be done to bring those regions the stability and possibilities which can end extreme poverty. That is an ethical imperative. Stark poverty, though, needs to be considered in relation to the rest of the world, including those of us who are far above the reasonable ceiling. There's a simple and compelling chart in Alan Durning's 1992 book, "How Much is Enough? The Consumer Society and the Future of the Earth". 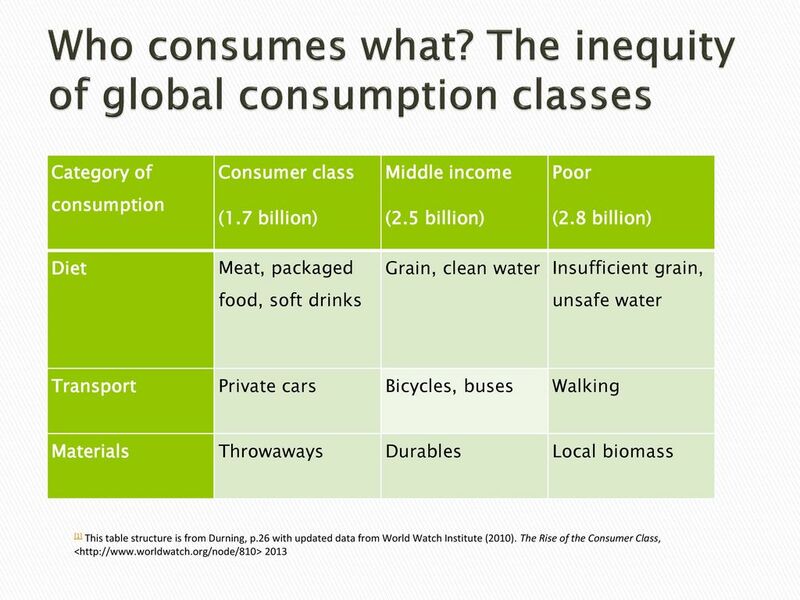 In an updated version of that chart, using 2013 figures, the global population is divided into three consumption classes: the consumer class (1.7 billion people), middle income (2.5 billion), and the poor (2.8 billion). I've also heard those three categories described as over-consumers, sustainers, and the poor, which is more accurate in seeing the consumption patterns of the relatively wealthy as a problem. It will be helpful if you take a look at the chart on-line, but each consumption class is described in terms of diet, transportation, and materials. The poor have insufficient diets of grain and unsafe water, get around by walking, and make things out of "local biomass." Those in the middle have grain-based diets and clean water, travel on bicycles and buses, and own durable goods. The consumer class eats meat and packaged foods and soft drinks, drive private cars (and now fly frequently), and have throwaway goods. That middle income category gives us some images for what enough looks like on a global scale. On a planet with finite resources, and limits to how much waste and pollution can be processed, the middle income sustainers are living in a responsible way. You'll notice, perhaps, that the sustainable way of life is still quite different from what I talked about last week. I bemoaned the prevalence of SUVs instead of smaller cars, and "adventure vacations" instead of closer-to-home recreation. Those kinds of "simplicity" are still way above the ceiling of enough in global terms. I'm glad that the desperately poor are a much smaller percentage of the global population. I'm deeply concerned that the consumer class is growing. That's why "an attitude of gratitude" and a commitment to sufficiency is important for the middle income, as well as those of us who are living within consumer culture. The values, expectations and desires of the over-consuming world have been seductive for the poorer populations. Those who have been in that middle, sustainer category are eager to become over-consumers, too. The desires and dissatisfaction that are spiritual problems in the wealthier parts of the world are also driving hopes for those who aspire to live like us. And governments see that growth into over-consumption as good economic news. the younger Chinese generation is more consumption-oriented than its predecessors. Unlike generations that came of age before the 1980s, people in China have access to the stuff that consumers in the rest of the world do. And the younger generation is also not as frugal as their parents and grandparents. Their consumption spending is growing at a rate of 14 percent a year. When we look at the descriptors in Durning's chart, we see that the Chinese consumers are demanding more meat in their diets, that they're driving more private cars, and that they're adopting throw-away practices, like the use of rapidly out-dated electronics. China -- and other countries with growing wealth -- are working hard to move out of the poor or middle income, and into the consumer class. They want to become over-consumers. They're eager to have the patterns of consumption that I describes last week as spiritually and environmentally toxic. An "attitude of gratitude," and a joyous acceptance of "enough" is an essential shift for those of us who are already over-consumers. We need to make that change, individually, and as a culture. And our conscious shift from over-consumption also needs to be a model for the rest of the world. "The American way of life" can no longer be the goal for the entire global society. Humanity's demand on nature has exceeded what our planet can replenish. Globally, we need the regenerative capacity of 1.6 Earths to provide the natural resources and ecological services we currently use. Sustainability requires a reduction in consumption, not the dramatic expansion that is happening in countries like China. For the poor, enough is about survival. For over-consumers and those at the upper end of the middle class, we now think of "enough" in terms of our wants, instead of our needs. It has to do with satiation, not survival. Neither of those extremes is viable. The livable space is between the floor and the ceiling, between severe poverty and unsustainable consumption. An attitude of gratitude, an acceptance of a reasonable standard of living for all, is essential for the health of the planet. Yes, we must seek "enough" for the poor of the world. Making that happen within the constraints of a limited world, though, will require those of us with wealth to choose a simpler way of life.